The Texas Department of State Health Services took an interesting twist on an old issue with a series of billboard ads that changed every two weeks. Their "Quit Smoking. Get Healthier." 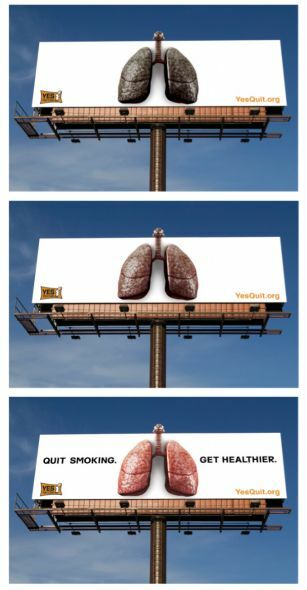 campaign showed a series of lungs which were painted a lighter color every two weeks, demonstrating that it's never too late to make a healthy difference when you quit smoking. The ever-changing image begs viewers to watch the story evolve before their eyes. But, perhaps even more importantly, this billboard offers a sense of hope. 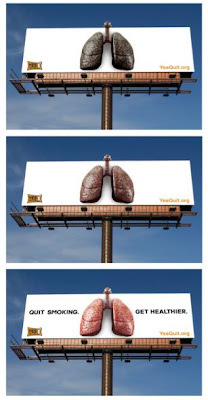 It promises that if you stop smoking, you will make a positive difference on your lungs ... and ultimately, on your life. Compelling? I sure hope so.